Earlier this week, when a 6th person in as many days asked for the exact location of Seletar Airbase, I knew it was time to persuade Isabelle to sketch out a map. Here is her rendition, complete with voluptuous coastal lines. Co-ordinates are 01 degree 25 N 103 degrees 52E. So now you know. Work on the Singapore-Johore Causeway began in 1919. It was officially opened by the Governor and High Commissioner Sir Laurence Guillemard on 28 June 1924. The Causeway was opened to goods trains on 17 September 1923. Passenger trains began to operate between Singapore and Malaya from 1 October 1923. During WWII as retreating British forces withdrew into Singapore a 70 foot-wide gap in the Causeway was blown off on 31 January 1942. 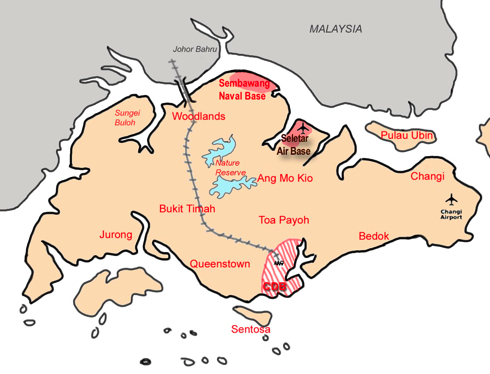 The Japanese invasion of Singapore began on 8 February 1942 and within a few days the Causeway had been repaired and became operational for the invading Japanese troops.